Your Bathroom Doesn’t Have to be Boring! Your bathroom should feel like a comforting spa. Do you prefer waking up with a hot shower, or relaxing before bed in a warm bath? Regardless of your preference, everyone appreciates crisp towels, a clean palette, and great bathroom lighting. However, a bathroom has the potential to be so much more than a white box. If you want to add more character and personality to your bathroom, keep reading for three valuable tips! 1. Go crazy with color. 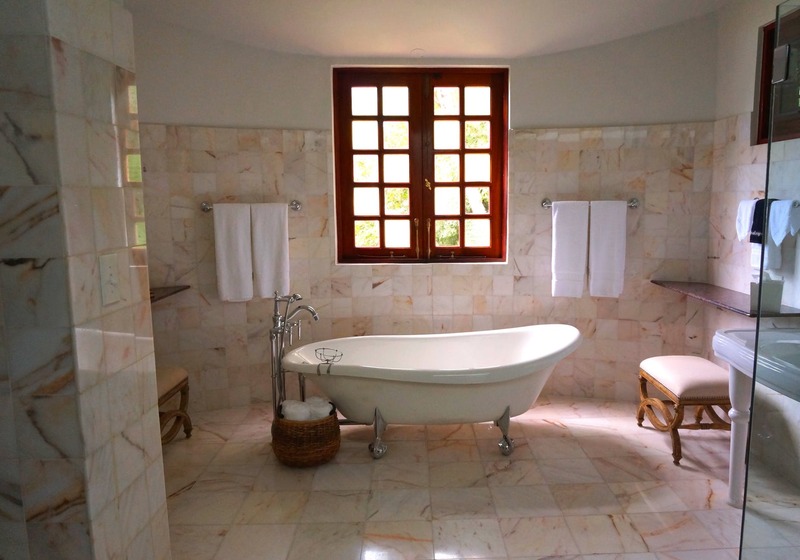 Your bathroom’s tile and flooring might be neutral, but there’s no reason to keep the walls plain. In fact, you can often get away with bold colors in bathrooms because there’s so much white to balance it out. Think emerald green or navy blue. Just be careful when selecting a hue, because pain colors will bounce around the room and onto your skin. If you’re tired of paint, it might be time to move on to wallpaper. There’s a huge range of styles and patterns, which gives you fantastic freedom to redefine your bathroom. The right pattern can make your space feel more cohesive and less claustrophobic. Linear patterns, like stripes, can establish structure, and floral patterns can soften busier rooms. Choose wisely, and your bathroom will look magnificent. In larger bathrooms, you might have a chance to invest in free-standing furniture. To combat enormous vanities and storage pieces that might overwhelm a bathroom, use small dressers to add storage space and bookshelves to store towels and various toiletries. Consider adding a small chair or stool to improve the function and style of your bathroom. Just make sure you don’t clutter your space. 4. Use art as a bold statement. If you’re sticking with a neutral color palette, you don’t want to put a chair in the bathroom, or wallpaper isn’t your thing, add some art to your walls. Make a large impact with larger pieces. Consider integrating something sculptural. Nothing is too off-the-wall.